Collard greens are a form of kale, and part of the cruciferous family of vegetables such as cabbage and its many relatives (bok choy, kale, brussels sprouts, broccoli, cauliflower). Collard green has broad, open leaves, and along with kale, are often considered one of the most ancient members of the cabbage family. Collard greens originated in Eurasia. It was introduced into the U.S. through the slave trade, likely form Africa or Haiti. Collard greens are popular in cuisine of the southern U.S., as well as in parts of the Mediterranean, Africa, Asia, and Latin America. The name collard comes from the word "colewort", meaning cabbage plant. Collard greens are a cool-season crop because of its resistance to frost. In fact, it is commonly acknowledged that collard green's flavor improves after the first frost. Collard greens are often used interchangeably with and confused with kale. Although both share the same botanical name and are in the group acephala (which means “without a head” in Latin), collard greens are lighter green in color, have broad, smoother textured leaves, are thinner, milder in flavor, and are more heat tolerant. Collard greens have a smoky note in taste. Common ways of cooking collard greens include slow braising and pan-steaming, seasoning with smoked and salted meats, and used as an accompaniment with fish or meat dishes. Collard greens are ubiquitous in Kashmir cuisine. Collard greens are also traditionally eaten on New Year's Day for prosperity, as the leaves resemble folding money. Smaller-sized leaves are more tender. 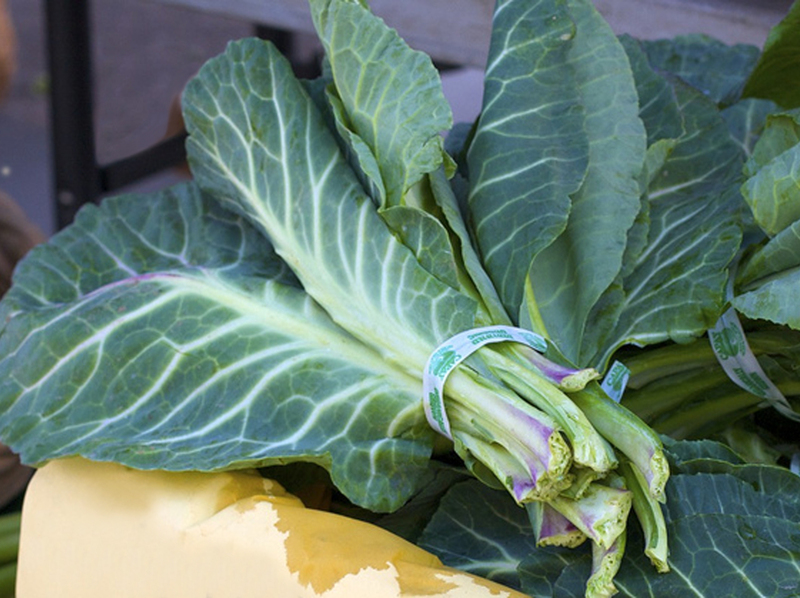 Fresh collard greens are best stored in the refrigerator, in a plastic bag, removing the air as much as possible. Collard green are a rich source of glucosinolates that imparts a spicy, bitter flavor, and are pre-cursors to cancer-fighting compounds. Cutting, crushing and chewing the vegetable releases these glucosinolates and activates their cancer fighting properties. But this activity degrades with exposure to air and at room temperature so collard greens are best consumed promptly after preparing. Methods of preparation can also affect the concentrations of glucosinolates. Boiling collard greens leaches out bioactive molecules because glucosinolates are water-soluble. It has been conjectured that Collard green's “open-leaf” structure allowing exposure to sunlight, is the reason why collard greens and kale contains higher levels of nutrients and and antiangiogenic carotenoids compared to tight-headed cabbages. Collard greens and other cruciferous vegetables contain glucosinolates, a mustard oil glycoside. The enzyme myrosinase, which is stored in a separate compartment of the plant cell, is liberated when the plant is crushed or chewed. Myrosinase converts glucosinolates to the bioactive molecules isothiocyanate and indole-3-carbinol, which are both antiangiogenic. Sulforaphane, is a type of isothiocyanate and has been demonstrated to inhibit multiple pathways in tumor angiogenesis. Cruciferous vegetables have demonstrated a role in preventing the risk of many cancers, including those of the breast, lung, colorectal, and non-Hodgkin’s lymphoma (NHL). The cancer-fighting compounds in collard greens and other cruciferous vegetables are glucosinolates and their products. These include isothiocyanates and indole-3-carbinol (I3C). (Glucosinolate precursors are also responsible for the strong, pungent flavor of raw onions and garlic and they account for much of the characteristic bitterness of cabbages and their relatives.). In experimental animals, benzyl isothiocyanate (BITC) reduces both angiogenesis (by reducing levels of vascular endothelial growth factor, or VEGF) and tumor size (through cell apoptosis). Kale and collard have among the highest concentration of lutein and zeaxanthin carotenoids in carotenoid-rich green leafy vegetables, and are associated with risk reduction for certain angiogenesis-related forms of blinding diseases such as age-related macular degeneration (AMD). In 2011, collard greens became the official State leafy green of South Carolina. I love collard greens but they have to be cooked for a long time to be edible. Does this long cooking process remove many of the healthy nutrients?